A holiday shortened week put the US markets into the 13th week of their current uptrend. 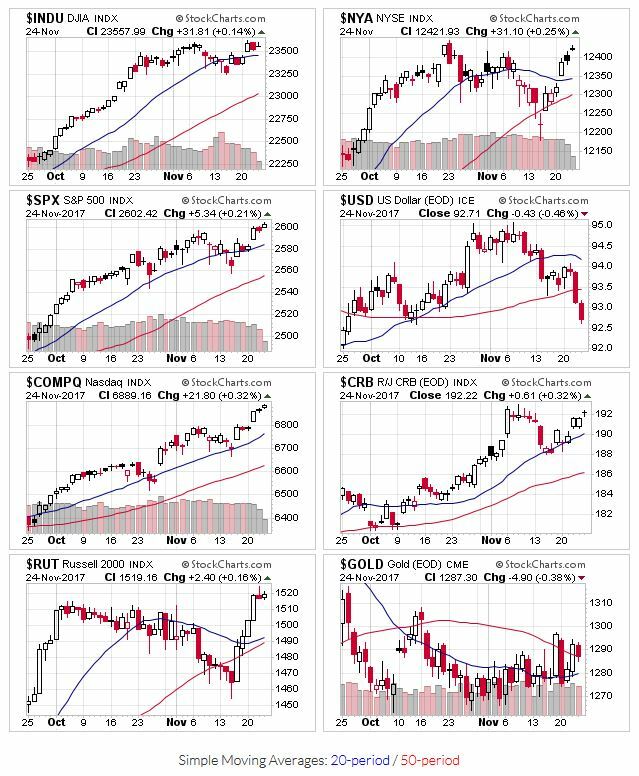 The NYSE recovered, so all the indexes start the week above their 20 and 50 day moving averages. Price and volume action remains the same as last week: okay. Leading stocks are extended, and new entry points remain few and far between. The OEW uptrend signals remain in place to start the last week in November. Leading stocks remain extended, so technical analysis hasn’t yielded many new entry points for growth strategies. Income strategies aren’t fairing much better, as valuations on the best income producing stocks remain really high. Several well known names have fallen on hard times, giving them artificially high yields. Don’t be fooled; their payouts are dangerously high, putting their dividends at risk for future cuts. Thanks. Just found your blog. I have been trying a weekly timing strategy as well. It’s been hard for me to keep my nose out of it daily though. Do you primarily make trades on Monday’s? Hope you find it useful. For the market outlook; yes, the trades are recorded as if they’re made on Monday’s. I’m a little more reactive to the downside when doing anything index based, so I’ll sell positions as soon as they give a signal, rather than waiting for Monday.